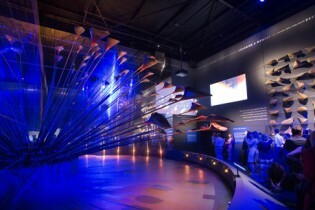 A new gallery housing the London 2012 Olympic cauldron has opened at the Museum of London. The busy VIP preview evening was attended by a sizeable Stage One contingent, including MD Mark Johnson, Technical Director Jim Tinsley, Sales & Marketing Director Tim Leigh, Senior Project Manager Adam Wildi and Mechanical Design Engineer, Gemma Webster. The Cauldron, designed by the internationally renowned Heatherwick Studio, is one of the most enduring and creative symbols of the triumphant London 2012 Olympic and Paralympic Games and is the single most complex device we have ever built. It consisted of an array of 204 individual copper petals, each one a unique shape and each one representing a competing nation. The petals were arranged in a concentric formation, affixed to the tips of slender steel stems, which at the given moment, slowly and sequentially raised the individual flames contained withing the petals, allowing them to converge into a single, unified Olympic flame. 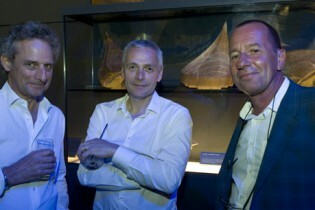 We specially designed and constructed the bespoke new pavilion that houses the ‘Designing a Moment’ exhibition. Two huge sections of the Cauldron are on display – including the original steel stems and copper petals from the rehearsal set. Combined, they are some of the largest objects the museum has ever acquired. One section presents the Cauldron in an upright position, as it was for the majority of both Games. The other is the Cauldron in an open formation, as if frozen at that climactic defining moment of the opening Olympic ceremony. 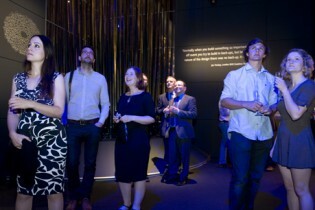 Described as “one of the best kept secrets of the opening ceremony”, the gallery immerses visitors in the design and making process of the Cauldron. 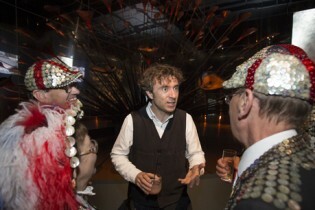 Exclusive filmed interviews with Thomas Heatherwick, the artistic directors of the Paralympic opening ceremony, key people from the Stage One cauldron team, as well as metalworking experts from Contour Autocraft, who formed the copper petals, provide remarkable insight into the rigorous design process, preparation, rehearsal and testing of the Cauldron. Behind-the-scenes films, footage of the ceremonies and technical drawings add greater context, alongside objects from the production stage – including a selection of the wooden forming blocks on which each copper element was individually crafted.